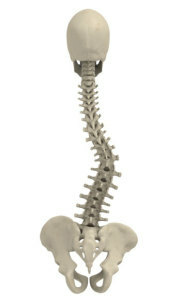 Scoliosis occurs when the spine curves. Often this is associated with vertebral rotation. Scoliosis commonly occurs in childhood but may also occur in adults. Adult scoliosis occurs as the spine ages and the supporting tissues of the spine, including the discs and the facet joints, become weakened and the spinal alignment may be affected. The vertebrae may begin to shift and rotate. If this occurs at multiple levels, the result may be scoliosis. Scoliosis can be detected on a physical examination as well as with radiographic studies such as x-ray, MRI and CT scan. Patients who have severe scoliosis are commonly referred for surgery because of the progression that may occur. In adults, however, the degree of deformity is often not severe but the symptoms may be. Nonoperative treatment is the mainstay for patients with painful scoliosis. Typically patient’s without neurologic deficits are referred for physical therapy, perhaps interventional pain management and medical management. Surgical correction is indicated for patients who have chronic or severe pain or patients who have developed neurologic weakness or patients who have refractory pain. Surgically, modern technology allows the surgeon to straighten the spine and decompress pinched nerves or spinal cord to prevent future damage and improve pain. This is commonly associated with a spinal fusion, or a bone graft is used to stabilize the spine and may involve use of instrumentation.